I like to do crafts. I really like to do crafts with my kid. I especially like new and educational or sensory type of activities we can do together and that hold her attention for longer than two minutes. Chuckles LOVES to paint so when I saw this idea on Pinterest, I had to try it with her! Marshmallows? Check! Soy based paint (just in case she mistook it for frosting on the ‘mallow)? Check! A stack of construction paper thick enough to create a masterpiece for each family member? Double check! We were ready to create! She was too excited and dug right in before I got the “clean” picture. I’m not really sure where I went wrong, but let’s just say that marshmallow painting turned quickly into an ooey, gooey mess! I’m sure the kid “shaping” the marshmallows into triangles and hearts had nothing to do with it. Neither did the licking of them behind my back. Right? Making this sticky of a mess takes great concentration. Well, despite the mess and the fact that it didn’t quite turn out Pinterest perfect, I think she had fun. More importantly, I made dinner in peace! I try so hard to not complain about this pregnancy. It’s a blessing and miracle in so many ways, not the least of which is that this baby is sticking! I am 28 weeks along and I feel so much more secure knowing that if all H-E-double hockey sticks broke out and this kid decided to make an early appearance, his/her chances are looking pretty good. Beautiful miracle and all considered, there are a couple of not so awesome things about being pregnant for the second (third) time while wrangling a toddler with the attention span of an ape. This leads me to what I have learned are the top ways to be a truly awful mother….at least in my own mind…and why I’m convincing myself it’s ok.
1. Why I am the worst mom ever: Today is day 15 of the last 30 that will include peanut butter in some form at all three main meals for Chuckles. Creativity around here is at an all time low and unfortunately, her dietary experience suffers. If I have to think up a Pinterest-worthy dinner for this two-year old who will likely turn her nose up before a single bite is chewed ONE MORE TIME, I am going to lose it. So, I won’t. Why it’s ok: I mean, peanut butter is totally a protein, right? Nevermind the sugar content…I buy organic, natural, have-to-stir-or-you’re-eating-oil peanut butter, so it can’t be that bad…right? Right? 2. Why I am the worst mom ever: I let Chuck have LOTS of independent play. At least that’s what I am telling myself as I lay on the couch concentrating on breathing through the baby laying on my lungs and trying not to fall asleep so C isn’t TOTALLY unsupervised. Let’s just say we have taken the “Montessori” approach to learning around here. In the last three days, she has poured an entire bottle of water on the carpet in an attempt to “play tea party” with Mickey Mouse, drawn a masterpiece on the laminate wood floor with a dry erase marker and drank half her body weight in soapy water after she begged (and I obliged) to stay in the bath just a LITTLE too long…in the middle of the day. Why it’s ok: Hey, she’s learning! Water on the floor= you gotta clean up after yourself. Art on the floor= cause and effect (translate: Mama loses her mind a little before she realizes dry erase marker WILL erase from laminate! Yay!) Drinking bath water= learning about anatomy…and digestion…and soap may lead to less than favorable bathroom experiences. So really, I rock as a pre-school teacher. 3. Why I am the worst mom ever: C has learned and implemented some new phrases. She now speaks like a 15 year-old, angst ridden teenager and I have realized it can only be coming from one place. I mean, how many toddlers look their mother in the face and say with all seriousness, “I just can’t do this right now, Mom.” This is in regards to finishing her cereal, I might add. Perhaps telling her “I just can’t do this right now, C,” in reference to sitting in the bathroom with her while she poops and I try not to gag on heightened pregnancy senses was NOT the wisest, but I had no clue she would soak THAT in. Sure, I throw out plenty of “please” and “thank you’s” but THIS is what she latches to? Sheesh. 4. Why I am the worst mom ever: She seriously knows all the words to at least three Bubble Guppies episodes and 4 Mickey Mouse Clubhouse episodes. Notice I said all the words to the EPISODES…not songs, not rhymes…entire episodes. Apparently, this kid has been allowed to watch so much TV that she can recite the script for her two favorite animated shows…WITH inflection! Who does that? Who lets their toddler watch so much tv that she could play understudy to the characters? Me. Giant, pregnant me. That’s who. Why it’s ok: One part of classical education, which is the philosophy behind most homeschooling curriculum, is learning through memorization. I like to pretend that someday, when it’s time (in two years or so, eek!) I will be equipped and prepared to homeschool Chuck and her sibling. Well, we are well ahead of the curve when it comes to memorization because let me tell you, C can recite her ABC’s as well as the whole lunchtime scene from Bubble Guppies episode 1.4. Again, I rock as a preschool teacher! 5. Why I am the worst mom ever: I use other people’s children to wear mine out…so I don’t have to. 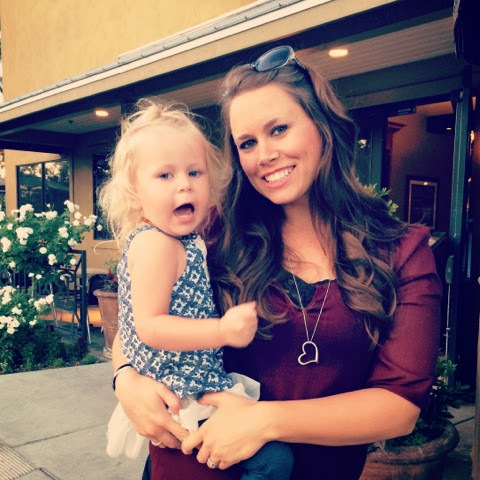 Back in the olden days…read: pre-pregnancy…the kid and I took daily walks or park dates and I would chase her and squeal and slide right alongside her sweet, smiley little self. I pushed her on the swing endlessly and swam with her in the community pool. Now that I am a whale, such physical exertion feels nearly impossible. Or, I’m just lazy. Either way, my friends’ kids have slipped into this role beautifully! She wants to be pushed on the swing? Set up a park date with my friend and her 7 year old! She wants to be chased? Invite her friend from next door to play tag. She wants to swim? Make friends with the preteens at the community pool who, “just LOVE” babies and watch them all screech with delight as Chuck jumps in and swims to them. These are my solutions to my lacking and her rising energy levels. Why it’s ok: She’s socializing! 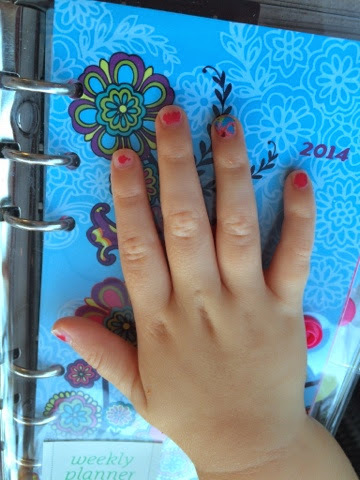 She has a more complete calendar than I do and her social skills have benefitted from it. Isn’t it what we strive for as parents? To help our kiddos grow into caring, empathetic, well-adjusted mini- humans? The only way for that to happen is for them to have regular interaction with other littles. So, in essence, my laziness is just giving her a leg up on overcoming potential social awkwardness. At the risk of judgment from my pre-parent self, I throw all this out there to let other pregnant moms know you aren’t alone. I’m tired, too. I’m not the same mom to Chuck now as I was 8 months ago and although this makes me sad and hard on myself at times, I know this is a season. The next season of our mother/daughter journey will include another little being and I am sure the dynamic will change once more. What doesn’t change, EVER, is my love and adoration for the sweet cheeks that grin up at me to tell me she feels the same. Hopefully, as I try to go with the flow, C will learn to be a flexible, forgiving human as well. If nothing else, she won’t ever be able to tell a therapist that I ruined her childhood by never letting her express herself…even if that was in dry erase marker! So many of my favorite bloggers do a weekly roundup of things that are making them smile at that moment. I believe imitation is the HIGHEST form of flattery, sooo…here’s my Merry Monday roundup. Inspired by my husband’s reminiscing around the campfire when we were camping last week about his step dad who made hot cocoa with milk and a chocolate bar, the realization we were out of creamer this morning wasn’t so daunting when I saw this left over Hershey bar in the fridge! Yum! Seriously. Ok, a few of you may remember a plea from after the Fourth of July for suggestions on how to get a coin out of a car CD player. Apparently, one little Miss Chuckles decided the car stereo was more “jukebox” than all around entertainment center and shoved what we thought was a quarter in the compact disc slot while we were joyfully roasting marshmallows right next to the car, completely unaware of her shenanigans. Well, a month later we were finally able to get the car in to the shop only to be told the damage would equal about $1100! I find it extremely ironic that this is almost the exact amount of C’s college fund at the moment! Obviously, I’m too cheap for all that mess. I quickly said, “thanks, but no thanks,” and resolved with Hfoe to figure this out for ourselves! And, we did! A few strips of tape, steady hands, a plastic fork and knife and TWO PAPER CLIPS in and we have made not .25, but .30! She had shoved a nickel AND a quarter in the slot and we saved $1100. I’m digging it! Chuck sleeps with a sound machine and although she CAN sleep without it, she goes to sleep much faster WITH it! So, when we had a sleepover with friends a few days ago and forgot the happy wave sounds she’s become accustomed to, I, of course turned to the Apple App Store. This free app not only has five different types of wave sounds, but also boasts rain, transportation, appliances and several other types of white noise for your choosing. I love that the sounds will stay on indefinitely unlike some of the other white noise apps out there and that you can close the app to multitask in other programs while the sound still plays. And did I mention, it’s FREE?! I’ve gotten big, y’all! This baby bug is determined to be huge and healthy and although that makes me so over-the-moon happy, the ensuing stretch marks and itchy skin are a little less appealing! So, this little sample that has been sitting under my sink for the last few weeks since the “Blogger’s Night In” event, broke out yesterday! And it is so perfect! It glides on my baby bump so smoothly and mess free and it smells just delicious! I have to get more because as you can see, I drained every last smidge from the sample packet! I used to watch the Today Show every morning. This was, of course, before a particular toddler took over morning TV with her love of Mickey Mouse Clubhouse and Bubble Guppies…my kid watches TV. Oops! It allows me to drink my morning coffee in peace and really, that’s better for everyone. Anyway, I have missed my morning crew! How exciting it was for me to see that one of my favorites of the gang was pregnant! I have been following Savannah Guthrie’s pregnancy journey in snippets since I don’t get to watch the show every morning, but the pieces I have read and pictures I have seen of her growing bump make me happy. She is a normal, weight gaining, maternity clothes wearing, mama-to-be! And she talks about it! All of it. This is so refreshing in the Hollywood baby bubble of “I only gained 10lbs while pregnant and it was all baby.” Yeah right. But this lady, this paragon of pregnant pretty…I appreciate her candidness! What’s waking you up happy this Monday morning? I’d love to hear! This post contains an affiliate link for Amazon. I don’t make millions, but your click and purchase could help make the few bucks it takes to keep my site up and running! Thanks in advance! Ok, so I have been super curious about this Jamberry nail thing everyone is so crazy about right now. When one of my best friends from back home decided to have an online party, I thought this would be a great time to check it out. They have some really cute prints for your nails! Surely this stuff couldn’t really be that great, though. I mean, I am a mom of a VERY busy toddler. We go to the beach and the pool and the park and my manicures always last about 2.5 minutes unscathed. That is when I get them done, almost every NEVER! Unfortunately, the week of her online party, I missed out on ordering because I was mid-travel and I lost track of time. I did, however, manage to win one of her party games due to my uncanny Disney trivia knowledge. That’s a whole other story. Anyway, when I missed out on ordering from the party I was bummed. But, the Heather announced that she was going to become a consultant and she approached me to do the “7 Day Challenge,” talking about it to all of you. Challenge accepted! She sent me a sample in the mail and the day I got it felt like that day in 5th grade when I got my first pen pal letter! So exciting! I quickly opened the envelope and ogled the adorable prints she had sent me. I promised myself that, tonight, once the nugget was sleeping soundly, I would treat myself. Around dinner time, the kid started melting down. She stubbed her toe or something else just as common that I can’t completely recall right now, and I had to do something to calm her down before she would settle for bed. Instantly, I thought of the fresh little present sitting on my counter in the bathroom! 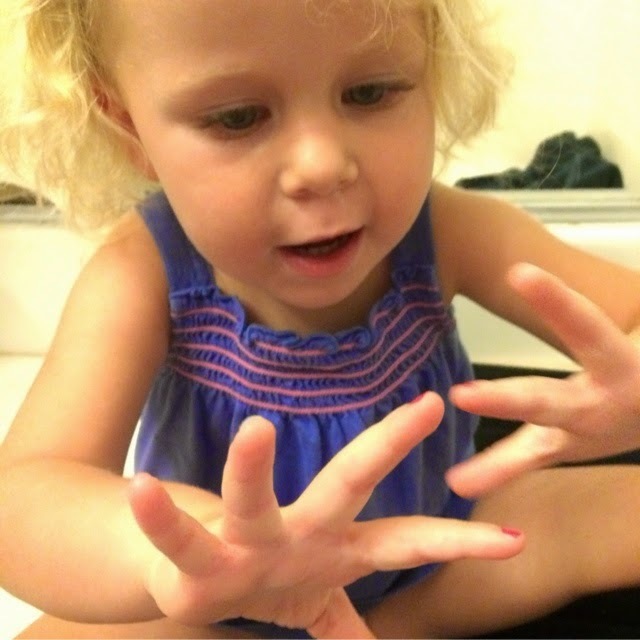 With the promise of “pinkies” as she calls painted nails, we headed to the bathroom for a quick pick-her-up. It worked! These things are so easy and quick to put on that even my two year old could sit still for the process. She was so in awe over her flowered ring fingers that the tears automatically dried up. 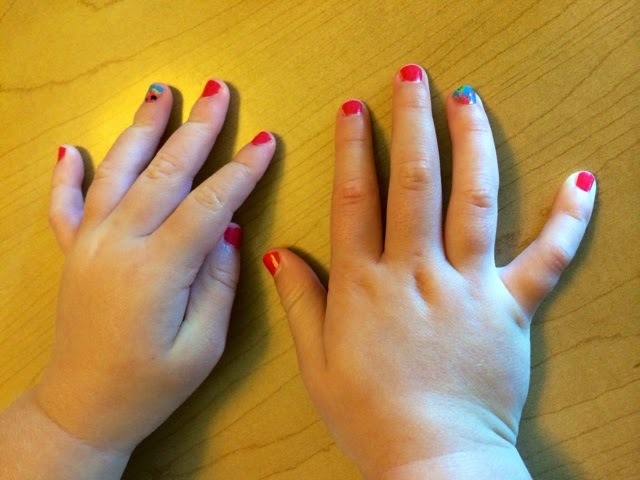 We did her nails on a Monday night and since I’m a mom and my days blur together…I finally took the challenge “after” picture 9 days later instead of 7! I am amazed. The painted nails looked horrible after only a couple days of chlorine and sun and playing in the dirt. But, these Jamberry accent nails still look like day one! If they do this well on a kidlet, I can’t wait to see how they will look on me! Freshly painted and ready to rock! Nine days later and still JAMMING! Paint looks icky, but the accent nails are hanging on! When I finally make time to do myself, I will report back and maybe I will have a little giveaway in store, too! Keep in touch! Until then, check out Heather’s website! I received free product to conduct this review. As always, the opinions are my own. 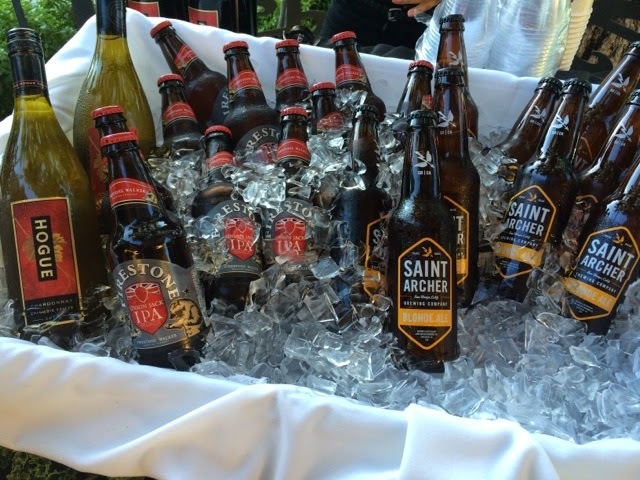 I was asked to attend a media event where food and beverages were given to me free of charge in exchange for an honest review. As always, opinions are strictly my own. As a blogger, sometimes opportunities come your way that excite you even more than they probably should. Usually for me, those opportunities involve food. Because I love food…free food is even tastier! 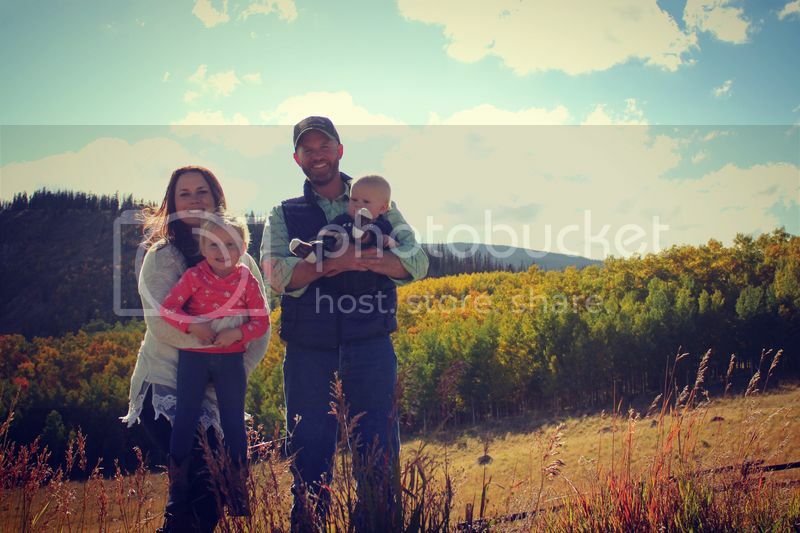 When I had Chuckles, our church family rallied around us with support and dinners. For two weeks after we brought our little bundle home, we had dinner magically delivered to our door by our brothers and sisters in Christ who wanted to help a new mom and dad to just relax and enjoy bonding with the new baby. It. Was. GLORIOUS! 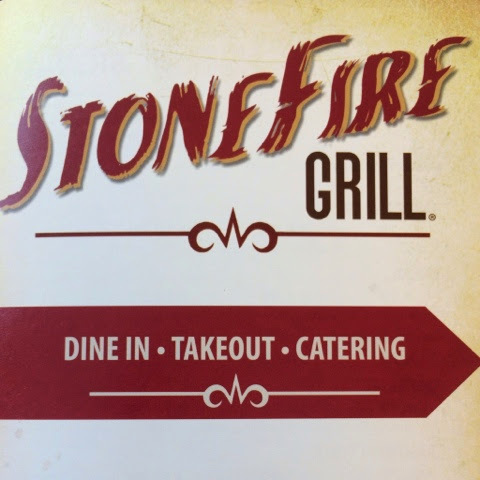 One of those memory-making dinners was from Stonefire Grill. I had never eaten at this place before, but whether it was post-delivery hormones talking or not, I was hooked on that scrumptious barbecue and garlic bread to write home about! 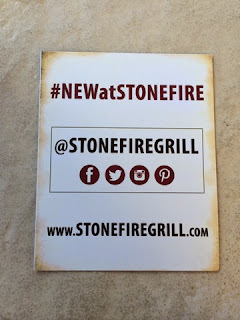 Lucky for me, I was presented with the chance last week to be a part of a media tasting event at Stonefire Grill introducing their new summer menu options. I, of course, jumped at the chance! I rsvp’d for me plus one, thinking this would be a wonderful date night for Hfoe and myself. After all, it’s not so hard to shell out $10 an hour for a sitter if dinner is comped! But, alas, hubby had to work on the night of the event. So, with a very deep breath and a few meditative moments of preparation for the unpredictable toddler emotions, I took Chuck as my “plus one.” My good friend Melissa over at MelissaDell.com has a daughter that is Chuckles’s age and they are buddies. She was in the same boat, so we made it a double mama-daughter date. 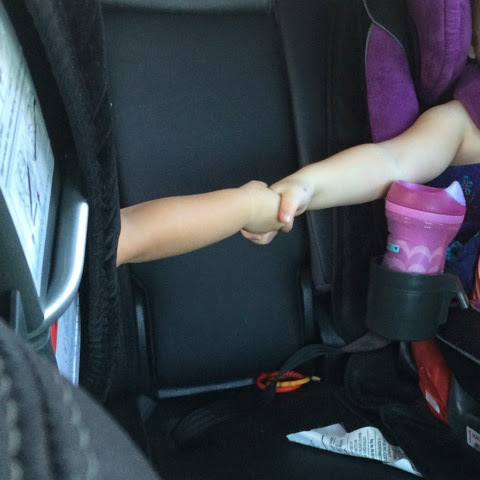 On the drive over, the girls sang Disney songs and held hands across carseats….this was looking promising for good dinner behavior! And they didn’t disappoint. 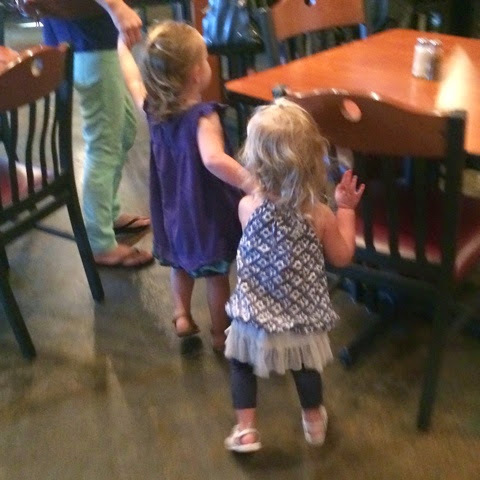 From the moment we walked into the restaurant patio, both girls were so well behaved. I am sure they were just as impressed as I was at the reception we received from the Stonefire crew. We were greeted by the owner’s son and summer menu co-creator, Justin, and presented with our choices of seasonal brews, wines or in my case, passion fruit tea. Sensing the toddlers’ short attention spans, Justin intuitively asked if he could pull together a couple children’s menu items for the girls to get them started. Sure! And the mac ‘n cheese was the hit of the evening for one blondie with discerning taste! Leave me alone, mother. This mac ‘n cheese is divine! Now, for the mama food. Yum! That is pretty much the summary of my experience. 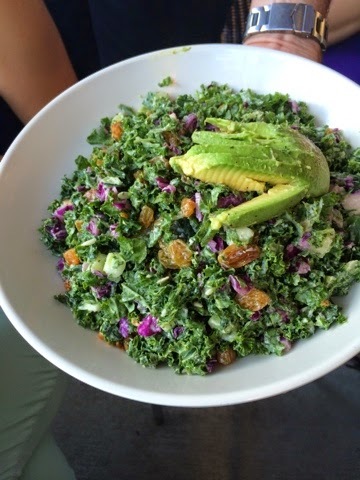 My first bite was from the new Keen Green salad, with it’s kale, quinoa and avocado. It’s not something I would probably generally order at this place I love for barbecue, but I was pleasantly surprised at the fresh, delicious flavors that were perfect for summer! Next came the roasted cauliflower pita and the Capresse sandwich. Which one is my favorite? I can’t choose. 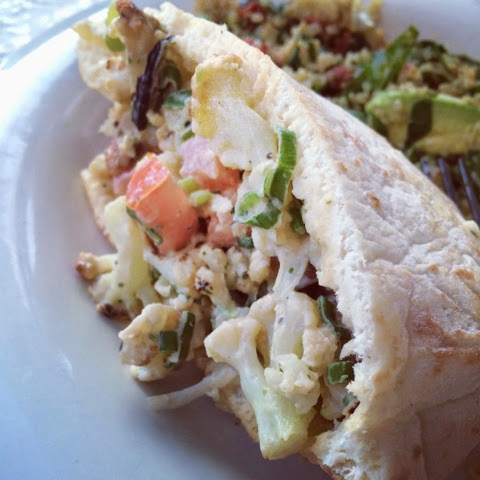 I never prepare cauliflower at home after I had an unfortunate experience once with a mushy restaurant side dish, so when I saw the pita, I was hesitant. But, so as to be able to give an accurate review, I tried it anyway. I am so glad I did! Chuckles even liked it! 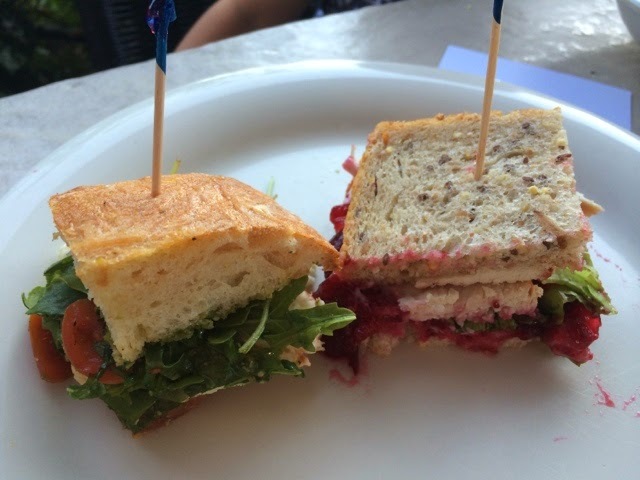 My highlight of the sandwiches I tried, though, was the turkey salad. Oh my goodness…and I mean GOODNESS! I would NEVER have thought to order this light of an option and receive this explosion of flavor! Over all, the dishes presented to us this evening were a smorgasbord of tasty choices fit for warmer weather, but still filling enough for lunch or dinner. The cherry on top of our evening was dessert. With a powder sugar-covered brownie and a slice of cheesecake, my plans of taking the girls to get yogurt after dinner for their good behavior quickly went out the window…gladly! 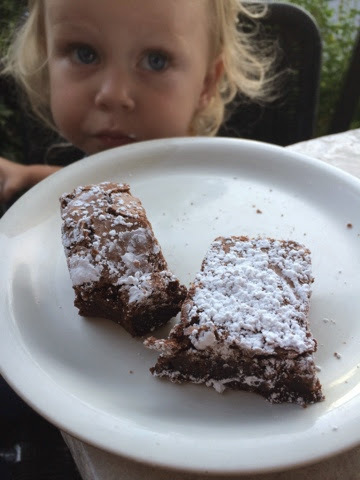 Chuck couldn’t even wait for me to snap the picture before she dove right into the brownie! Someone was a little impatient! To say the food was delicious would be redundant and an understatement, but my overall experience for this fun evening at Stonefire Grill was exceptional. I was happy to see how kid friendly the staff and menu were and how mama friendly the new summer menu additions are. It’s good to know on those nights Hfoe has to work late and I just don’t have one more creative dinner in me, I can take the kidlet down to Stonefire for a thoughtful, healthy meal. 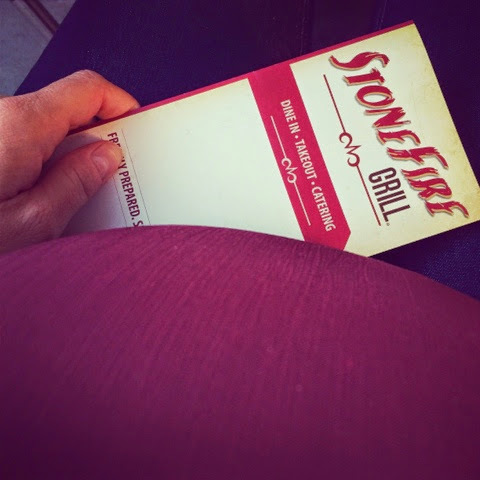 My girl and me…excited about the full bellies! WEST HILLS, CA 91307, but please visit Stonefiregrill.com to find a location near you and run there for dinner tonight! 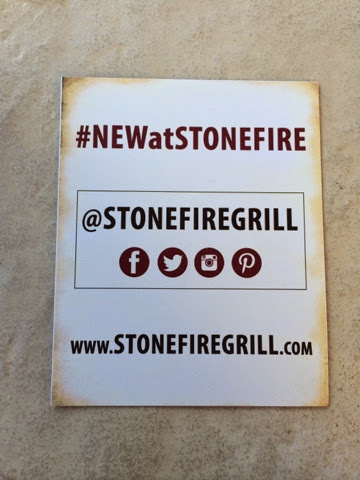 Thank you so much to the folks at Stonefire Grill who made our evening so enjoyable and yummy!